Jason Love, I couldn’t have said it better myself. This seems to be my life struggle. On one hand I am committed to health and wellness (this blog did come about after graduating from my Master’s in Public Health), yet on the other hand I have a constant need to ingest sweets. All things sweet. Yes, I tend to lean towards cake and ice cream but let’s be honest: I cannot recall a time in my life when I ever refused a cookie or brownie. This time of year, with the leaves falling, and the weather cooling down, I tend to gravitate towards apple pie. Be warned: I have very discriminating taste. If you try and serve me apple pie with cheap crust and canned apples I will throw it in your face. I mean that seriously. But, any pie with fresh apples (preferably macintosh) a buttery, flaky crust (perfect amount of cinnamon), and a slightly crunchy crumble on top, sign me up! 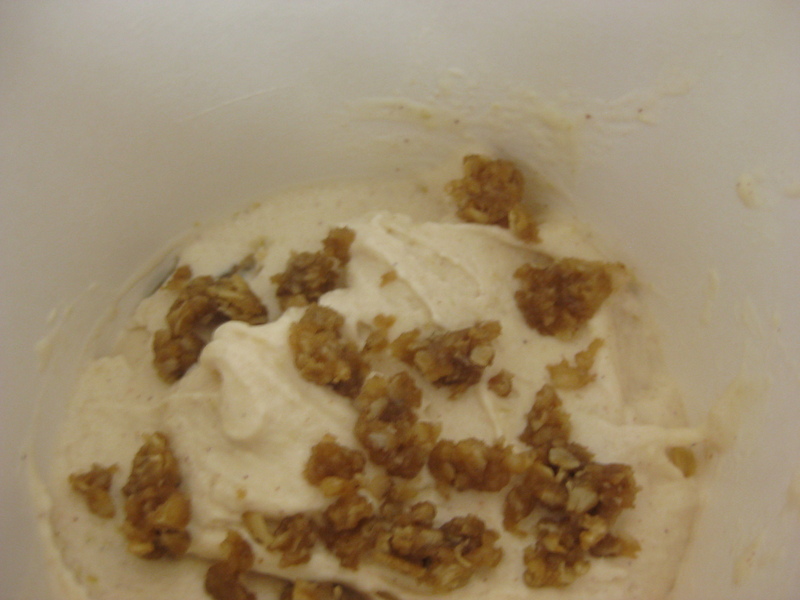 So, I set out to create my own version of apple pie ice cream. I read tons and tons of recipes, and couldn’t find one that I liked. Being that I’m finally starting to get the hang of this ice cream thing, I decided to create my own recipe. When I asked The Husband to taste the batter he exclaimed, “wow, that takes just like apple pie.” Success. My hope for all of you is that as we enter the Jewish new year, we all find something that we love, and pursue it. 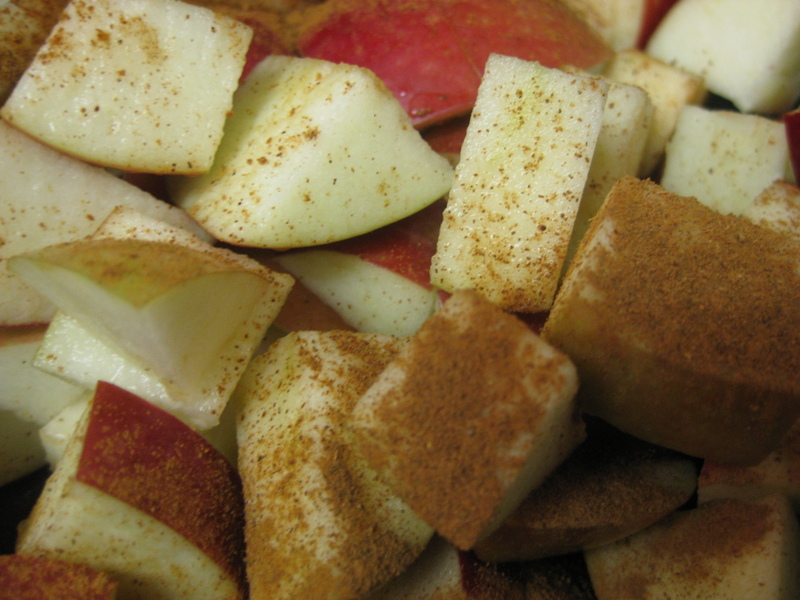 There's nothing bad about apples and cinnamon! This recipe requires a number of pots and pans, and the ability to multitask. Essentially you’re going to be making three components of the recipe at once. 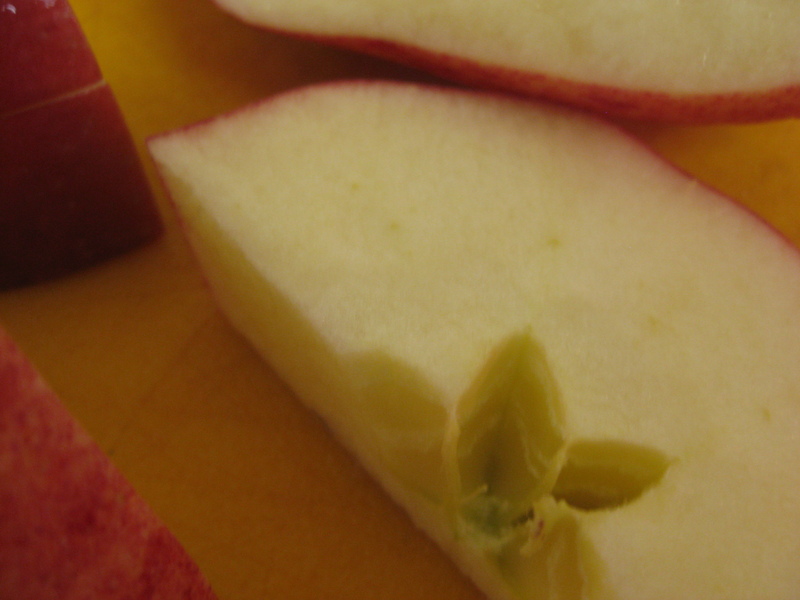 First, slice the apples into small chunks (do not peel) and put into a medium pot. Add cinnamon, nutmeg and water. Cover and heat for 10-15 minutes, stirring every few minutes so that the apples do not burn. After 15 minutes remove from the heat and set aside. In the meantime, whisk together the three egg yolks, and slowly add in the sugar. You’ll notice that as you add more sugar, the yolks become more pale in color and thick in texture. Third, while all this is happening, put the half-in-half in a large pot and heat. Once small bubbles begin to form around the sides remove from the heat. Now you’re going to temper the eggs. At this point your apples will be cooked and set aside, and your yolk/sugar mixture will be ready for tempering. Slowly pour the half-and-half into the egg mixture, whisking continuously. Repeat until all the half-and-half has been blended with the yolks and sugar. Pour the tempered eggs and apple mixture into a blend and puree until smooth. Immediately pour this new mixture (which incorporates all the ice cream ingredients) into the medium pot and heat until it reaches 185 degrees. WARNING: If you over cook this by even a second, your mixture will taste rather eggy and it will be ruined. Also, you may notice that once this mixture is heated, it doesn’t smell that good. Don’t worry, let it cool, taste it, and it will be delicious (I’m speaking from first-hand experience here!). Let the mixture cool completely before refrigerating for at least 2 hours or overnight. In the meantime, make the crumble topping. 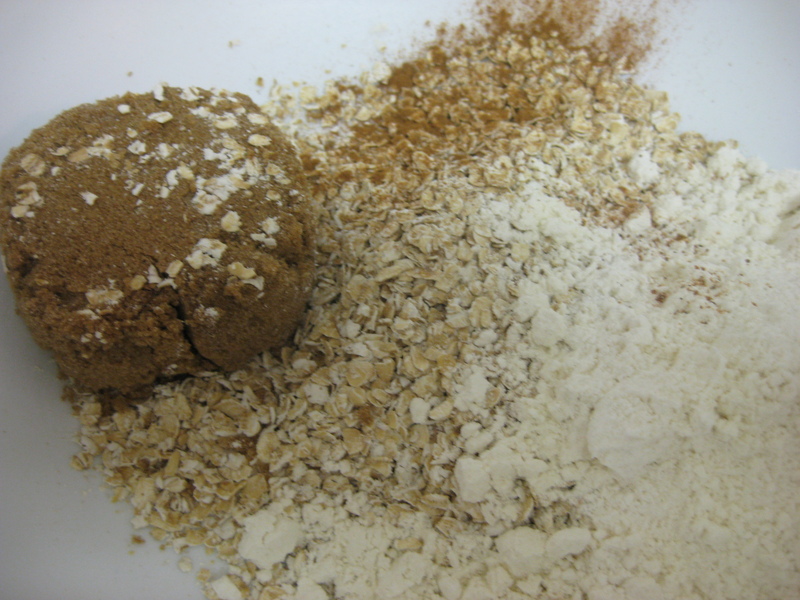 Pour the oats, brown sugar, flour, cinnamon and nutmeg into a mixing bowl. Stir together. 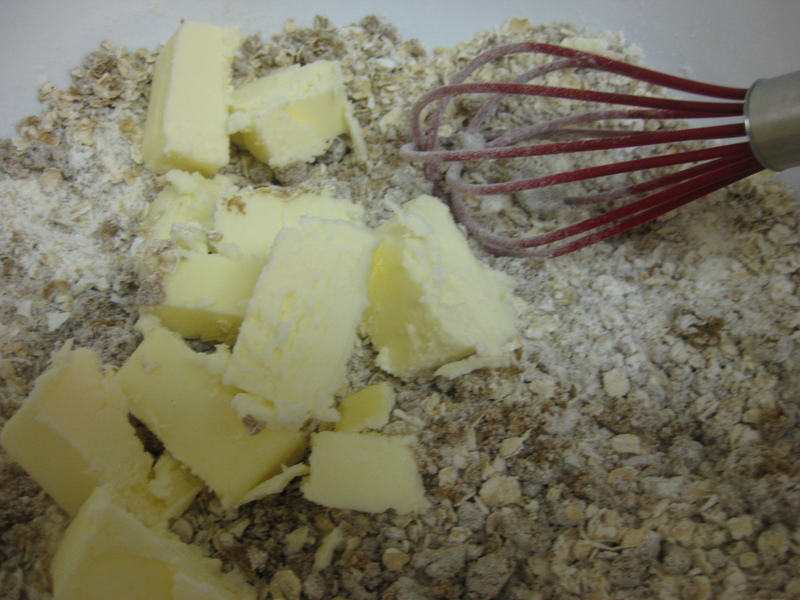 Add in the chunks of butter and mix with your hands until small chunks form. Place these chunks onto a baking sheet (line with either parchment paper or tin foil to avoid a messy clean up) and bake for 8 minutes at 350 degrees. Remove from the oven, flatten out the crumble and bake again for another 2 minutes. Let the crumble cool entirely before freezing. Look at those crumbles. Yum. Once the ice cream mixture is cold, pour it back into the blender and puree for 30 seconds so that the mixture is very smooth before churning. Pour into the bowl of an ice cream maker and churn according to the manufacturer’s instructions. 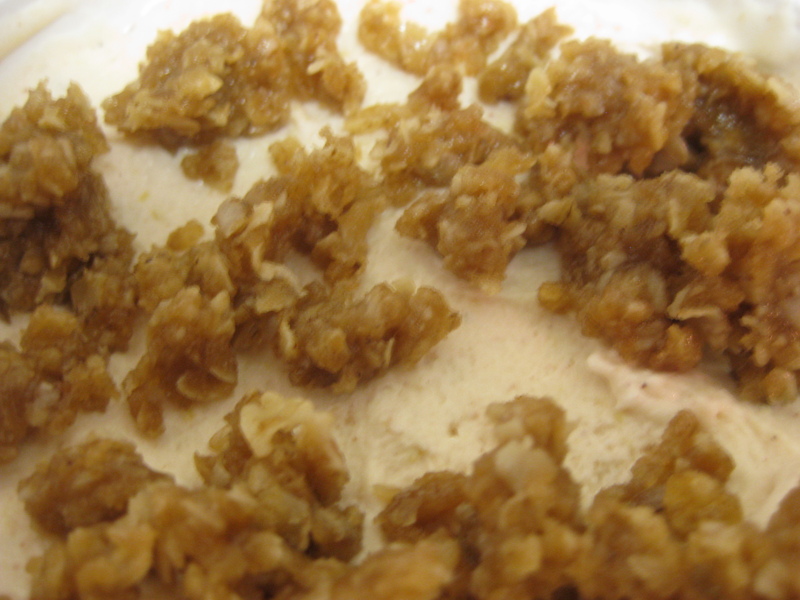 When finished you’re going to layer the ice cream with crumble and voila, apple crumble ice cream! Pour a few chunks of crumble onto the bottom of a freezer-safe container, scoop ice cream on top, and repeat until you’ve used all the ice cream. 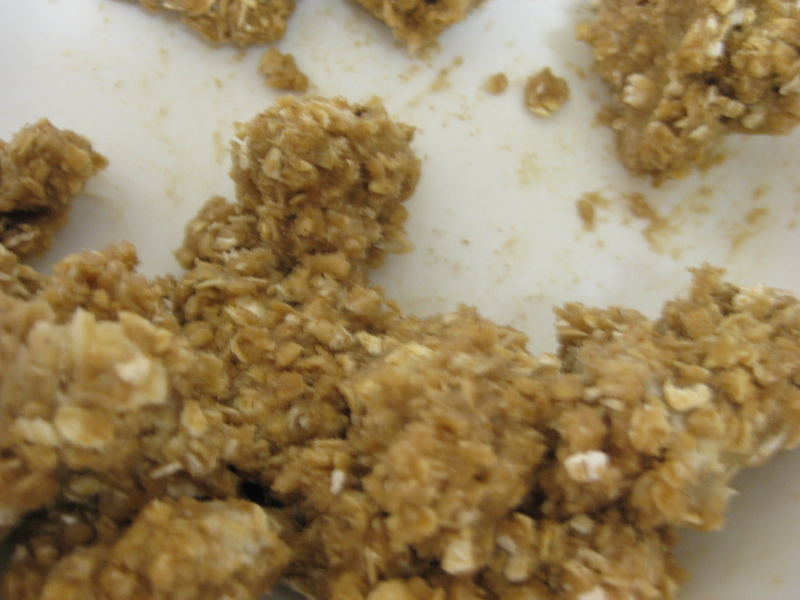 Top with crumble and freeze before serving. There will be left over crumble. If you’re feeling particularly sassy, whip up some caramel sauce, and drizzle on top before serving. Enjoy! Apple Crumble Ice Cream, coming right up! The Verdict: This flavor was good, not great. I think it had real potential, which is why I’m going to make it again. When I ate it out of the machine as I tend to do, it was delicious. But then when I had a bowl of it, I wasn’t as thrilled with the flavor as I was the day before. Bottom line, this ice cream tasted just like apple pie. So, if you love apple pie, you’ll love this ice cream. Enjoy!